Jamal Murray might not know which NBA team he'll play for, but he's always under control. SI.com examines the rise of the Kentucky Wildcat product. 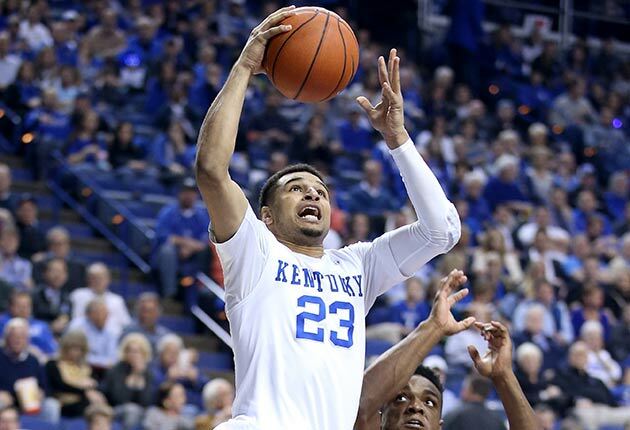 HARRISON, N.Y. — It’s a week before the NBA draft, and Jamal Murray knows this will be one of his final days on a basketball court before he’s officially a professional. Later tonight, he’ll leave for this sleepy suburb for New York City, and his calendar will overflow with promotional appearances and appointments with financial advisors and tailors and team representatives. But right now, he has just finished his final workout with fellow future lottery pick Brandon Ingram and before he has to film promos for Gatorade, he wants to try a few trick shots. He starts with a traditional halfcourt attempt, which he sinks in short order. Then he walks to the three-point line, turns his back to the basket and launches the ball over his shoulder without looking. He hits that shot without much of a struggle. And since he’s already facing the wrong direction, he decides to step inside the three-point line and fire at the basket on the opposite side of the court. This requires a few more attempts, but he still gets the bucket. Eventually he moves onto his more advanced material. He stands at halfcourt and heaves the ball in the air, trying to one-hop it into the rim. The Gatorade cameras are tracking him now, even between takes, so he wants to make sure he gets his shot. After about two dozen tries, he finally hits it. But he isn’t finished. “That’s not even my best shot,” he says. For his best shot, he walks toward the three-point line and faces a carpeted wall. He does some mental geometry and then squares up and underhands the ball off the wall, sending it arcing toward the rim. He misses. He lines it up again and misses again. His PR rep implores him to break for lunch, but he’s determined now. He takes a total of 35 attempts before he’s finally convinced to walk away. “I’d make it if I had just a little more time,” he says. Jamal Murray fully believes that he can make any shot on—or around—a basketball court. His confidence is rooted in the unorthodox training he endured and enjoyed nearly every day with his father, Roger Murray. And it’s that confidence that allows him, a week before the biggest night of his life, to obsess over a trick shot instead of over what city he’ll be living in next month. Before Jamal could walk or talk or even babble, he held a basketball. Roger Murray had grown up in Jamaica obsessed with Bruce Lee movies and martial arts, but when he moved to Canada with his family at nine years old, he discovered basketball. He taped Michael Jordan’s games on TV and studied everything from his footwork to his shot motion and then took those lessons to the court. He didn’t play basketball for his high school team—he ran track instead—but by the time Jamal was born, he was spending every spare minute from work playing pickup or practicing. He helped Jamal learn to crawl, walk and then dribble. He’d bring Jamal to all his pickup games, and by the time his boy could talk he was begging to play with the adults. Sometimes Roger would have to call a timeout in his games so that he could hoist Jamal in the air and let him take a few shots. Eventually, he’d pack Jamal’s yellow Fisher–Price hoop into the trunk and set it up on the sidelines so they could play at the same time. When Jamal was 3 or 4, Roger took a photo of him in the driveway beside that toy hoop and told his wife, Sylvia, that he would be in the NBA one day. He wanted Jamal to be prepared mentally and mechanically, so they began to train together every day. Roger had learned about mindfulness meditation from Bruce Lee’s books, and he began teaching it to Jamal when he was about 4. If a fly landed on Jamal’s forehead, he’d tell his son to ignore it. If Jamal came home complaining about an argument with another kid, Roger would instruct him to contemplate the fight for one minute and then let it go for good. He’d sit with Jamal on the couch in the living room and create a game out of who could stay still the longest. He used the same method on the basketball court. Roger focused first on his son’s ballhandling and shooting, making sure that fundamentals became the solid foundation on his game. Then he began to prepare his son mentally. At the park near their house, he’d blindfold Jamal before he shot free throws. At the hoop in their backyard, he’d try to distract his son as he shot, making jokes or deriding him, telling him he should quit basketball because he wasn’t any good. Jamal learned to block it all out and swish shots regardless of sights or sounds. Number one could've been a much closer debate this year, but Simmons has had the clear edge ever since the Sixers won the lottery. Brett Brown knows his family from his days in Australia, Simmons trusts The Process, and this is already done. There are real questions about his work ethic at LSU and how he'll fit in the NBA, but he's got the highest upside on the board. He's 6'10 with point guard skills, and if he can develop a dependable jumpshot and improve on defense, he could be somewhere between LeBron James and Draymond Green—the two best players on the floor of an NBA Finals Game 7 a few days ago. For the Sixers, that kind of upside is worth the risk. Ingram's my favorite player in the draft. He looks like he weighs 150 pounds, but he plays bigger, and he was fearless for Duke last year. All the typical draft buzzwords apply to his place in the top two—he's got a freakish wingspan (7'3), three-point range, the ability to play multiple positions and tons of upside—but I like Ingram for his intangibles as much as anything. He played his tail off against bigger players all year long, he got better as the season unfolded, and by the end he was clearly the best player on Duke's team at 18 years old. The Lakers are apparently settled on Ingram, and L.A. fans should be thrilled. The hype comes full circle! After half the NBA decided Brown was overrated over the past few months, he's now right back in the mix near the top of this draft, and he could surprise everyone Thursday. Boston has liked Brown since the regular season, and if the Celtics keep this pick, here's to betting that Ainge goes for upside on the wing. This is the same GM who was ready to trade four first–round picks for Justise Winslow last year, and Brown does a lot of the same things. With a reliable jumper, he could turn into a terror on both ends of the floor. Or, to think of this a different way: If the Celtics can't trade for Jimmy Butler, maybe they can draft him. Speaking of hype... Chriss came out of nowhere—he's only played basketball for five years, he wasn't ranked in the top 50 out of high school and he only played about 25 minutes per game for Washington (thanks in large part to foul trouble)—but over the past month he's exploded up draft boards. He's got the highest ceiling of anyone beyond the top two. That's partly an indictment of his lottery peers, yes, and he's also got a much lower floor than someone like Jaylen Brown, sure. But all of that is what makes this fun. Will Marquese Chriss turn into a full-on pick-and-roll nightmare next to Devin Booker, or will he be 2016's Tyrus Thomas? Let's find out! Minnesota could really use Dragan Bender in this spot, and a future built around him and Karl–Anthony Towns would be terrifying. On the other hand, Kris Dunn may be the safest bet in the draft outside of Brandon Ingram, and between injuries and Ricky Rubio rumors, the Wolves point guard situation isn't quite as solid as you might think. Dunn was one of the most productive players in the country at Providence, and he's the closest of any lottery pick to helping a team from Day One next year. He's built like a tank and plays like it—there's no way Thibs will be able pass on that, right? Anyone who watched him in the NCAA tournament against Indiana saw him struggle against NBA length and quickness, and his lack of athleticism will make playing defense a struggle. But look at some of the best combo-guards in the NBA—Curry, Harden, McCollum, even Devin Booker and D'Angelo Russell last year—and there are plenty of examples of talented guards who faced a lot of the same skepticism at draft time. The Pelicans should grab him hoping that he can get to that C.J. McCollum level next in a few years, and knowing that his three-point shooting could help them regardless next season. Bender's size and ability to space the floor will make him valuable wherever he lands, but as the youngest player in the draft, it'll take him a few years before he's ready to contribute. Even then, he may not score enough to be a true superstar. All of this is why he could slide tonight. But he could also turn into a skilled glue guy who can pass, shoot, and guard multiple positions on defense. For a Nuggets team that already has Nikola Jokic and Jusuf Nurkic at the five, adding Bender as a stretch–four would be a major win for the long-term blueprint. According to ESPN's Chad Ford, the Kings have been shunned by almost every prospect in the first round. Players have refused to work out, and many have refused to even provide medical records. Apparently nobody wants to be the next Nik Stauskas? In any case, Sacramento is opening a new arena this season, Boogie is in the final two years of his contract and still hasn't made the playoffs, and the Ben McLemore Experiment has been on life support for a good 24 months now. Hield's best case scenario is the Bahamian J.J. Redick, which would be great in this draft. Even in the worst–case scenario—Jodie Meeks?—his shooting should help off the bench. Poeltl has been a favorite of mine for a while—possibly because it's so much fun to pronounce his first name (YA-KUB). After two years in the draft the spotlight has hurt some his of buzz, but he should be a pleasant surprise for whichever team lands him. His size alone will make him a factor against most modern big men, and he's skilled around the rim. He's smart and he's mobile, and if his shot blocking isn't elite, his team defense should be excellent. If the Raptors think they'll lose Bismack Biyombo, Poeltl's a good replacement, and probably the best player available here. The Bucks could go in a couple different directions—Wade Baldwin, Timothe Luwawu, and Henry Ellenson are all options—but after talking it through on this Bucks podcast with friends at Brew Hoop, I'm pretty sure drafting Davis is the best option. He's raw and probably a few years away from helping as a starter, but this would be a smart long-term play. He can protect the rim, rebound, and best–case scenario, he can knock down jumpers and spread the floor. Davis can definitely do the first two, and maybe even the third. Do it, Bucks Mafia. General question: Does anyone know what the Magic are doing? The pieces in Orlando don't necessarily fit, but they've got so many young players from the past few years that there aren't any obvious holes to fill, either. For now, let's assume they go for upside here. Skal is a few years and a few thousand Chipotle burritos away from banging with NBA big men, but if he can put on enough weight to hold his own, he's got all the tools to be an excellent rim-protecting stretch five (think Channing Frye). Let's see... Undersized, underrated, high motor, high IQ, star of everyone's favorite Cinderella team... He's basically already a Hawk, right? And this is definitely the best–case scenario for Domantas Sabonis. He's good and productive now, but if the Hawks can help him add a perimeter jumper, he could be excellent for the next 10 years. Luwawu's highlights a) lead this draft class in dunks-per-minute and b) make me want a Mega Leks jersey. At worst, he can be a helpful energy role player off the bench. At best, he can hone his three-point shooting and grow into a long (6'11 wingspan), athletic monster on the wing playing next to Devin Booker in Phoenix. The Suns could also take Henry Ellenson here, but I hope they roll the dice on Luwawu. This draft pick doesn't even matter. Bulls fans are all still shell-shocked after the Derrick Rose era suddenly turned into the Jose Calderon and Robin Lopez era, and it's hard to blame them. Having said that, Wade Baldwin's defense and three-point shooting make him a perfect fit for everything the NBA values now. If Jimmy Butler's going to be handling the ball more, it makes sense to add a point guard who can defend and spot up for three while Butler creates. I lied when I said Brandon Ingram was my favorite player in the draft. Furkan Korkmaz is my favorite player in the draft. Wherever he lands tonight, I hope ESPN shows his full, six-minute dunk contest—dunking over that couple's romantic dinner, and then putting on the Darth Vader outfit for the finale—and gives the people what they need. He's also only 18 years old, and probably the best draft-and-stash prospect in this draft. Assuming the Nuggets won't add three rookies this season, Furkan at 15 is a smart play. Jae Crowder gets an understudy! Prince can play either forward spot, he's built like a linebacker, he dunks like a linebacker, and his three-point shooting is solid. The Celtics don't have many glaring needs (beyond star power that this draft won't provide), and as a role player who will win over Boston fans within his first month, Prince could be great. There was talk over the weekend that Memphis encouraged Richardson to shut down his workouts, because if he slides to 17, the Grizzlies plan to take him. That's a little bit puzzling considering some of the struggles he had during the regular season at Syracuse, but he's a good shooter with tools that could turn him into a starter down the road. Ellenson may not fall this far on draft night—Toronto, Milwaukee, Denver, and Phoenix will all be tempted—but if he does, it's hard to imagine he slips past Detroit. He's a perfect stretch–four for Stan Van Gundy, with the potential to play next to Andre Drummond or come off the bench as a stretch–five while Drummond sits. His defense will be a work in progress, but this low in the draft, his size and skill would be a steal. This could be a chance to steal a long-term sidekick for Emannuel Mudiay. Beasley's a little bit like Marquese Chriss. He wasn't on anyone's draft radar coming out of high school, and even now, he's something of a mystery. He can shoot, he's explosive, and while a little undersized, he's got all the tools to grow into a solid defender. Most importantly, my favorite fact of the draft is that both his parents are actors, and his dad is currently working on Bloodline, trying to get paid by Kevin, unaware that Kevin did a bad thing—I'm so in on Malik Beasley. Valentine would probably be closer to a lottery pick if teams weren't scared off by injury concerns over a possibly degenerative knee. Still, his shooting and skill on offense can help anyone, he's one of the smartest players in the draft, and as a four-year senior, he'll be ready to help right away. All of it sounds like a player Larry Bird would fall in love with. Plus, the Pacers bet on Myles Turner's health last year and that worked out pretty well. Now that Schroeder is the new Teague, maybe Atlanta needs a new Schroeder? Murray is giving off strong Tony Wroten vibes—great physical tools, can get to the rim at will, can't shoot, probably should've stayed in school—and maybe that scares some teams. It should scare some teams. But the Hawks' staff has been consistently excellent at developing young players, and Murray has more to work with than almost anyone. Juan "Juancho" Hernangomez is skilled and he could see time at either forward position in the NBA. His athleticism will be a question mark, but he plays incredibly hard to help compensate. Meanwhile, the Hornets may lose one or both of Nic Batum or Marvin Williams this summer. Grabbing Hernangomez could be a good insurance policy for the future. If the Celtics can't swing a trade, they'll likely look to draft–and–stash at least one of these picks. They could go with Zizic here, or Ivica Zubac, another 7–footer from the Adriatic League. Zizic is the more active and athletic of the two and figures to fit better with the direction of the league, but the Zizic-Zubac debate will (hopefully?) come down to the wire. Jackson's long-term future probably makes the most sense as a high–energy third guard, but given how barren the backcourt in Philadelphia has been, he could make sense as a starter in the immediate future. Most importantly, he's got good length (6'5 wingspan) to help himself defensively, and he can hit spot-up jumpers, a prerequisite for any guard playing next to Ben Simmons. Diallo was basically invisible at Kansas this past season—3.0 ppg, 7.5 mpg—but a great combine and crazy physical tools—7'4.5" wingspan—has helped boost his stock into the first round. He has Biyombo potential off the bench, and the Clippers could draft him here and pay him roughly $70 million less over the next few years. Not a bad deal. Patrick McCaw has all the tools to become an awesome two-way wing in a few years. He's long, he's big, and he shot 36% from three last year. He got lost on a crappy UNLV team that fired its coach, but if his shooting improves, and he could turn into a real steal this low in the draft. Either way, he'd be a much better project than most of the wings the Sixers have had the past few years. Zubac could go much higher, and at 19 years old, there's plenty of room to grow after another year or two overseas. The recent track record of the Adriatic League big men (Nikola Jokic, Jusuf Nurkic) is certainly encouraging. In any case, the Suns are unlikely to bring all three picks to the NBA next, so this would be a nice longterm investment if he's available. Ulis is dealing with some of the same injury concerns facing Denzel Valentine, and for a point guard who's already 150 pounds and 5'9", giving teams more room for skepticism is not ideal. But look: People around Kentucky basketball have been effusive in their Tyler Ulis praise for two years, and I will bet anything he'll be productive wherever he goes. If injury questions lead him to San Antonio and a bench mob with Kyle Anderson and Boban, this slide will be 100% worth it. In real life, given the uncertainty surrounding both Andrew Bogut and Festus Ezeli, Damian Jones or A.J. Hammons make more sense for the Warriors. In this mock reality, all that has ever mattered—in March, April, May, and June—is setting Caris Levert free in Golden State. Don't talk to me about a Jones fracture. We're here now. The draft is in 12 hours. Can't quit before the miracle happens. Jamal was more than ready by the time he reached high school. He became known for his dazzling and creative offense, for being able to sink shots from any angle and at any moment in games. Once, as a freshman, he injured his right shoulder but scored 26 points playing left-handed. In April 2015, as a junior, he earned MVP honors at the Nike Hoop Summit by scoring 30 points in the World Team’s win over Team USA. Later that summer, he scored all 22 of Team Canada’s points in the fourth quarter and overtime to secure a win over Team USA in the Pan American Games. After those performances, he decided to graduate from high school a year early and enrolled at Kentucky. John Calipari could tell right away how well Roger had raised Jamal, but there was still plenty of room for improvement. After a February game against Georgia, Calipari told reporters that Jamal was addicted to bad shots “like crack cocaine.” He asked Jamal to inform him the next time he took a bad shot, but Jamal never copped to one. •​​ Special Delivery: Will Dragan Bender be the NBA's next Croatian star? He finished his freshman season with the highest scoring average for a freshman ever at Kentucky (20 points per game) and nine three-pointers shy of Stephen Curry’s D-I freshman season record. When Jamal held a press conference to announce his decision to go pro, Roger sat right beside him. Then, in a room full of reporters, Jamal hugged his dad for almost 20 seconds. Before each game he plays, Jamal takes mental images of the court. He counts the steps from baseline to baseline and then closes his eyes and follows the same path again. He stands under the net and flips the ball of the backboard to test the bounce of both. He wants to control every factor he can. Once he’s satisfied, he retreats to the locker room to meditate. On Thursday night in Brooklyn, he’ll wait for a fateful phone call in the green room. Cameras will monitor his every move, the crowd will cheer or jeer every pick and his cell phone will probably buzz every few seconds. But he won’t be distracted. He has already controlled everything he can. He won’t know where he is headed until he gets that phone call, but he is confident his father prepared him for whatever comes next.